Going back to school can definitely be bittersweet. It may be sad seeing the summer weather fleeting away and the time next to the pool dwindling; but not all of it has to be sad. Whether you’re a parent waiting for some time alone, a highs school student dragging their feet, or a college student anxiously awaiting to leave, there are plenty of ways to make going back to school easy and enjoyable. While school can come with busy schedules, stressful assignments, and new experiences, there are a lot of tactics you can use to decrease those negative aspects. For starters, getting back on a normal sleep routine before school starts can be extremely helpful. Start putting the kids to bed earlier again, or put yourself asleep earlier and set alarms in the morning resembling the time you normally need to wake up. Adjusting your sleep schedule before the year starts will make your mornings much easier. Your body will start to form an internal clock and want to go to bed early and wake up early, helping you get that full 8 hours of sleep you will want each night. Sleep is one of the most important aspects of your health. When your sleep schedule fails, the rest of your wellness routine could be negatively affected as well. Once you’ve started establishing a sleep schedule, the fun parts can commence. You or your child may not be too excited about the earlier bed time and wake up call, but one way to get them interested in the new year is new school supplies. Take them to office max, target, walmart, office depot, or where and go shopping together! Get school supplies, back to school clothes, backpacks, and more. Whatever you may need, new items are a definite way to make everyone more excited to go back. Another dreadful part of school for kids is homework. This year, make homework a little more comfortable by setting up a « homework center. » Filled with their new supplies, create a space designated for homework. This could help make homework a little more fun or « cool » if they have a fun, decorated area just for them. Other things to think about before the school year starts are yearly check ups, after school plan, sitters, etc. While it may seem stressful to think about all of those plans now, it will pay off later. Make sure to schedule the doctors appointment, figure out if your child is doing any after school activities, if you need a sitter or nanny if you work, and review the school material needed. 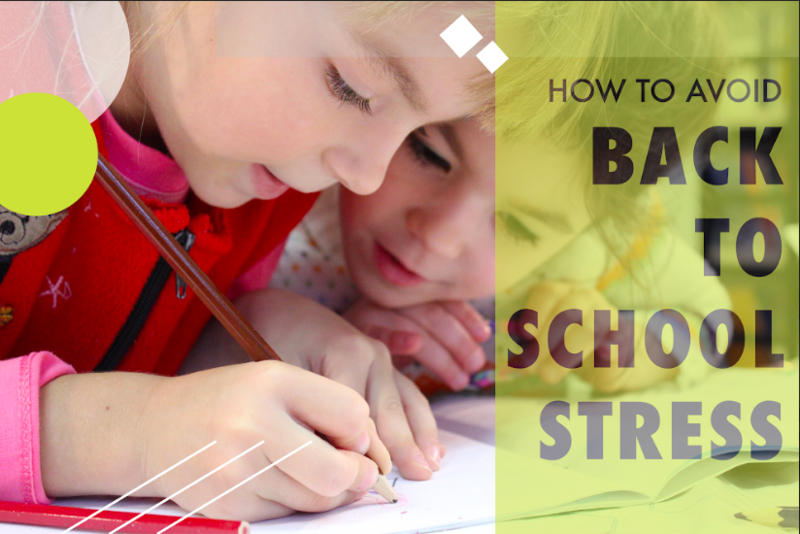 Start the school year organized and you will feel much less stressed as the year continues. Now that you’ve established what to do for your child when preparing for the end of summer, what about you? Sure, you can get organized and restart a normal sleep schedule, but there is much more you can do to prepare for the beginning of the school year. Even though summer can be relaxing at moments, it can also be very hectic. Constant plans and parties, no school for the kids, endless activities, and more. As the kids go back to school and you suddenly have 7-8 hours free 5 days a week, you can think about yourself. With the crazy summer schedules, you may have let your goals or normal wellness routines get a little loose. Now is the time to get back on track! That free time means more time for workouts, meal preps, walks with friends, and other healthy habits. After your long summer, a massage is definitely a good idea. Massage therapy will help with the summer stress, the back to school stress, and prepare your body for whatever may come next. Elements Massage is here to provide you any massage service you may need. Whether you need deep tissue, reflexology, salt stones, hot stones, cold stones, aromatherapy, or a custom session, Elements will cater to your needs. After taking care of the kids all summer and getting them organized for the school, you deserve some you time. Spend it the right way and come into our studio in Whitefish Bay! Call our studio during business hours or visit our website to book an appointment 24 hours a day. Ask a therapist about what massage may be best for you!